Wenger the iconic Swiss Army knife manufacturer has this week take the wraps off a new line of survival tools called the HyperX range which have been designed to be carried as pendants rather than the traditional knifes. Wenger has designed their new range of slim HypeX tools to be small, lightweight pieces with a handful of useful tools at your disposal. The full range consists of 6 individual pendants and will be launched later this year. 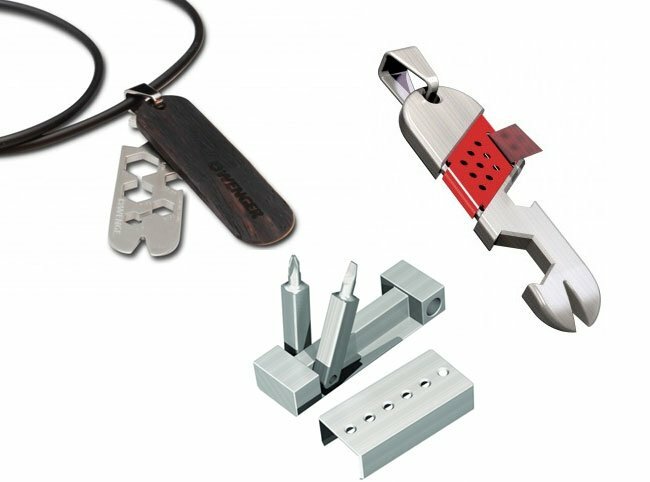 All the pendants have been designed to provide different tools for different occasions and even though they may not be your most important survival tools they do provide some useful devices. For example : The Wyss puts a can opener, bottle opener, hex wrench, pry and wire stripper at your disposal. While the Ridge offers a multi-size hex wrench, pry, bottle opener and wire stripper. Pietra provides an emergency whistle, and the wooden Whug pendant carries a pair of tweezers. Wenger’s Buss gives you both flat and Phillips screwdrivers, and finally, the Corkoran gets a portable corkscrew. Wenger will launch the new HypeX range of survival tools around June with prices ranging from $60 up to $100.